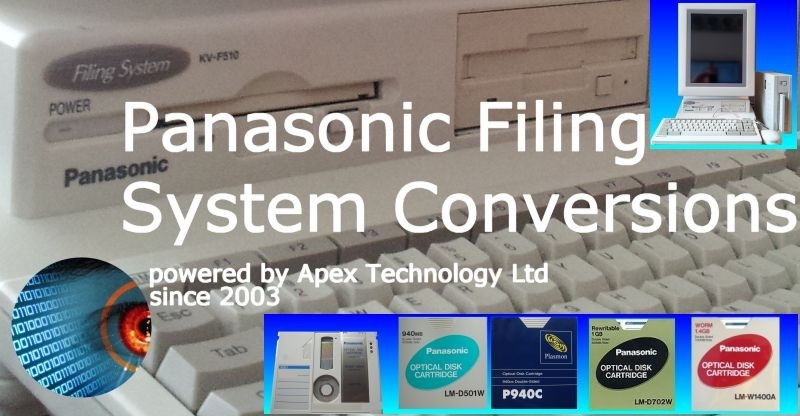 We can convert Panasonic Filing System Optical Disks. Model numbers are typically KV-F510 KV-F520 KV-F51MU known as a DIP (Digital Image Processing Station), Microfiche viewer, and it provided a scanned document storage system to replace traditional filing cabinets. The Panasonic Filing system used the optical disks to provide expandable storage for scanned documents. The optical disks were either 3.5 or 5.25 inch. If you need a Panasonic Filing System Optical Disks Conversions and Export service, then contact our friendly company. We can convert Panasonic Filing System Optical Disks. Model numbers are typically KV-F510 KV-F520 KV-F51MU known as a DIP (Digital Image Processing Station), Microfiche viewer, and it provided a scanned document storage system to replace traditional filing cabinets. The Panasonic Filing system used the optical disks to provide expandable storage for scanned documents. The optical disks were either 3.5 or 5.25 inch..